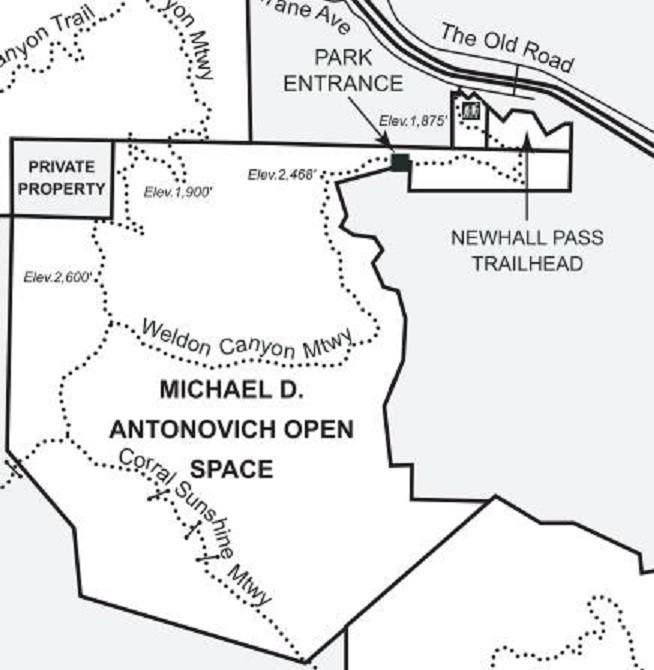 The 480-acre Michael D. Antonovich Open Space occupies some of the most densely wooded portions of the 4,000-acre Santa Clarita Woodlands. Trail access to the park is available from the East Canyon Trailhead along The Old Road in Newhall, from the Newhall Pass Trailhead on Weldon Canyon Road in the Newhall Pass, and from O''Melveny Parkin Granada Hills. Trails from these three trailheads converge at the crest of the Santa Susana Mountains. From this point, the Oat Mountain Motorway follows the crest of the range westward, past the Ventura County line. The park features mixed woodlands comprised of bigcone Douglas-fir, bigleaf maple, coast live oak, California black walnut, native ash, and valley oak.